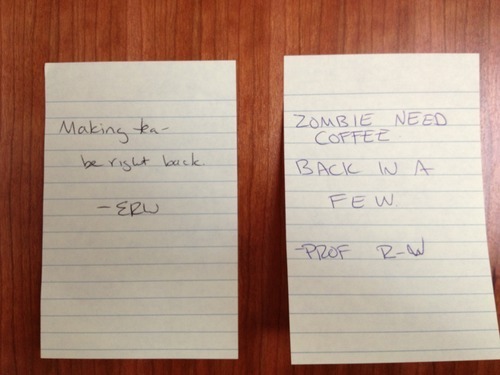 I leave post-it notes on my office door when I’m running somewhere and I think a colleague or student might swing by and I want to tell them I’ll be back, don’t leave. If I think the occasion is likely to occur again, I keep the note on the back of my door for posterity. I noticed a difference in tone between two of them today. See if you can spot it. Nope, nothing on the DW side for Tumblr. I don't know about any tools that would do it either, alas. I wonder if Tumblr has post-by-email. and it looks pretty compatible with DW post-by-email, including the attach-pictures thing, so you could prooooobably update both by putting both in the to: field. If you see a post on azurelunatic about my current adventures in hi-fi hair dye, then it worked. It hasn't shown up that I can see. I suspect post-to-Tumblr is a Special Goddamn Snowflake. You are so awesome. <3 Thanks for trying to hack it for me. Oh well, even if post by email worked I'd probably just do it manually because I am a Lazy Goddamn Snowflake.